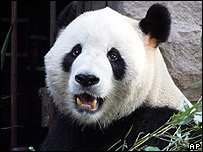 A drunken Chinese tourist says he bit a panda who attacked him after he jumped into a zoo enclosure to "hug" the bear. Zhang Xinyan, 35, had drunk four draught beers before deciding to enter the Beijing Zoo pen belonging to six-year-old male panda Gu Gu. The startled Gu Gu bit both legs of his intruder, who responded by biting "the panda on its back", Mr Zhang was quoted by state media as saying. Mr Zhang said he had not realised pandas could be violent. He told the Beijing Morning Post that he had come to the Chinese capital "only to see the pandas". "The seven-hour train ride was exhausting, and I drank bottles of beer when I arrived then had a nap," he added. The newspaper said Mr Zhang had a "sudden urge" to touch Gu Gu with his hand, so he jumped over the waist-high railing into the enclosure. "When he got closer and was undiscovered, he reached out to hug it," the newspaper added. Mr Zhang was bitten first on his right leg, and then on his left. Newspaper photographs showed him lying on a hospital bed with blood-soaked bandages over his legs. "I bit the panda on its back but its fur was too thick," Mr Zhang recalled. He went on: "No one ever said they would bite people. I just wanted to touch it." Zoo spokeswoman Ye Mingxia said the panda was unharmed and they were not considering punishing Mr Zhang yet. "He's suffered quite a bit of a shock," she told the Associated Press by telephone.